Just step across the street to beautiful seven-mile Grand Beach located at 1 Graham Street! Room for a family reunion or just plenty of room to vacation comfortably in this sprawling, nicely decorated home. Roof-top deck with five-person hot tub. Watch the sun rising over the ocean from the hot tub. Views from deck - Bidderford pool to Prouts Neck. Wow! Five more decks surround the house to see all the spectacular seven-mile beach. Master suite with king bed (see the ocean from bed) with sliders leading to private deck overlooking ocean. Five other large bedrooms with three that have ocean views. Two living rooms, one has five floor-to-ceiling windows with ocean views and game room with full-size air hockey, bumper pool and foosball. Large modern kitchen with six-stool breakfast bar, dining area with ocean view. Dine outdoors on the dining deck with ocean views. With laundry room on first floor. The amenities are endless!!! Beach is very quiet and relaxing. When you are looking for entertainment, it is just eight-tenths of a mile to Old Orchard Beach 'pier' and amusements (restaurants, lounges, arcades, etc.). 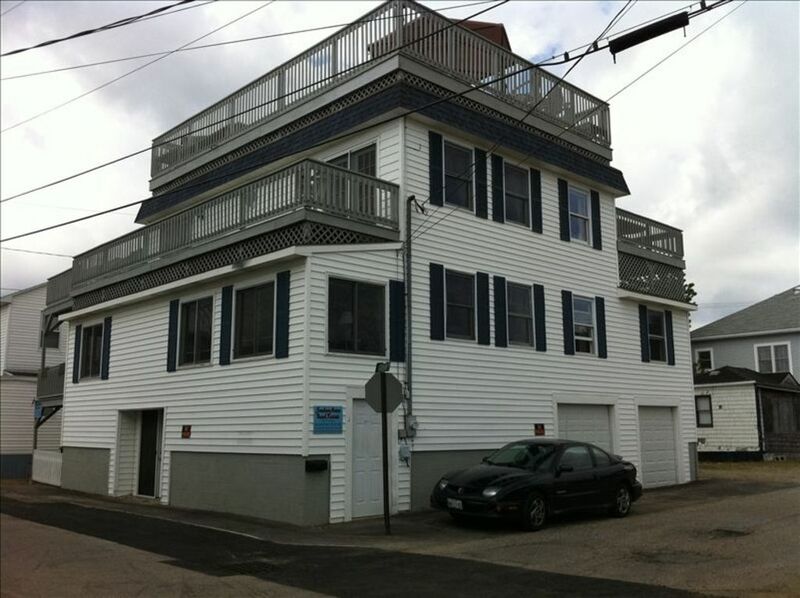 Nearby beaches of Kennebunks, Wells, Ogunquit, York, Kittery (outlet malls), and all their attractions!!! Beautiful ocean views, with complete family fun. (2) One regular size and one beverage. Updated with new stainless steel appliances including a beverage refrigerator. New flat screen tv's with built-in DVD players in 2010. (5) 5 different decks including the roof top deck. 6 person hot tub on the roof top deck. Garbage disposal, Spices, Cooking Utensils, Pots & pans, Wine glasses, & Dishes and for an additional fee linens can be provided. This was a perfect house for our annual Memorial Day weekend getaway. We have 3 families that get together that weekend every year and this was the perfect house for us. The beach is right there, the hot tub on the roof was perfect, the house has anything you could ask for and more! The weather didn't cooperate with us but the owners were totally accommodating and very wonderful to work with. My family stayed here during the month of November for a few days and we couldn't have asked for anyplace better. With ten family members, it made no sense to even consider hotels when we had this amazing property available to us. The kids, granddaughter and relatives who live in the area fell in love with this house and the location. It was quiet and beach access was perfect! And the owners were fantastic! We still reminisce about "the best family vacation we ever had" and hope to return in the very near future.